Well, hopefully you were greeted ten hours later with something as beautiful as this. This is my wife’s culinary pièce de résistance. This is her Sistine Chapel…her 1988 National Championship. You laugh? You think I’m kidding? Not so fast, my friends! 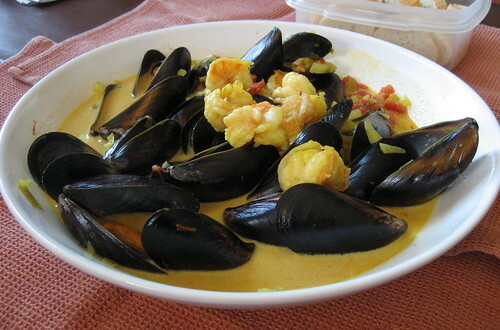 This is just another foray by Gail into the world of bouillabaise-like dishes. This is clearly her best effort yet. First she debeards the mussels, which is somewhat stomach churning. The fact that I ate and enjoyed something that had to have its “black fibrous beard” pulled off is a testament to my complete trust in her culinary expertise. I would tell you how she makes this, but it’s too complicated for me. My eyes glaze over when she talks about it. Besides “debearding,” she uses terms like “vegetable reduction” and says that “just the right amount of Pernod has to burn off.” I don’t get it, I just eat it. Write me an e-mail if you want the recipe and I’ll have her recite it. But I don’t need to understand each step or know each ingredient to actually enjoy it. I don’t know what fennel looks like, but I know I like it. I couldn’t pick out saffron in a blind taste test, but I’ve had a lot of yellow stuff that tastes damn good so I know I like it also. And anise flavor is good in many things; you’ll never see me tossing out the black Jelly Belly Beans. C’mon, all that plus a sauce with garlic and onions, man, how can it not be good? Note the slices of French bread in the background. That’s a perfect medium for soaking up the sauce and providing a platform for the mussel as it makes its way to my mouth. It’s pretty much perfect folks. Posted in food on 2007/10/03 by John.